Our mission is to be a national leader for the education, advocacy, promotion and funding of the service dog industry for veterans. Sierra is S and Delta is D in the NATO phonetic alphabet. For our mission, the S and D stand for “Service Dogs.” By utilizing the NATO letters, we are demonstrating our commitment to serve military veterans. 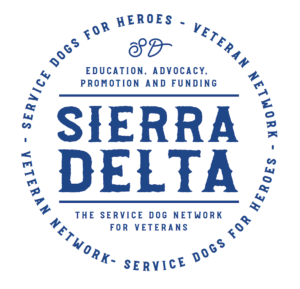 A network of service dog organizations who work together to provide an effective resource for our nation's veterans. With the help of community partners, donors, and accredited service dog providers we are building long-term relationships to push the needle to assist veterans. We draw upon our expertise and military background to teach veterans about service dogs and the service dog industry. We provide one-on-one guidance to navigate the industry and recommend best-fit scenarios after we review an applicant's needs. We expedite the process of learning where to acquire a service dog and how to apply to help veterans transition quickly and successfully from military to civilian life. With our 11 partner providers, we have cultivated a network of nonprofit organizations with aligned missions of helping pair service dogs with veterans. From the west coast to the east coast, Sierra Delta has been an advocate for working together to improve our assistance to veteran applicants. We believe that pooling resources and connecting each individual to a partner provider that fits their needs will benefit our nation's heroes. Many military veterans come home from service wounded, disabled, and with emotional needs. Service dogs are invaluable in providing the support some veterans need to continue productive and healthy lifestyles. By offsetting the costs associated with placing service dogs, we allow our partner providers to focus on what they do best, raising and training high-quality service dogs. As a result, we are able to pair more service dogs with veterans on a yearly basis. "Papa Alpha" stands for "Public Access". Public access service dogs are specifically trained to aid with PTSD, balance, loss of limbs, vision loss, and hearing loss. Service dogs are trained to get help in emergencies, provide perimeter checks, retrieve and pick up items, wake up veterans from night terrors, open and close doors, pull wheelchairs, and help with daily chores and activities. "Lima Bravo" stands for "Life Buddy". We are in the process of developing our non-public access service dog program. This program will benefit veterans looking to acquire a trained dog, but not a fully-certified, public access service dog. To learn more about this initiative, please check our website for updates and information. Sign up for our e-newsletter to stay connected.